If you are familiar with advanced financial calculators, you will find the features in DreamCalc easy to use. When working with cash values, DreamCalc adheres to a sign convention that money received is positive, while money paid out is negative. For example, a cashflow in which the first value is negative indicates an initial investment (i.e. 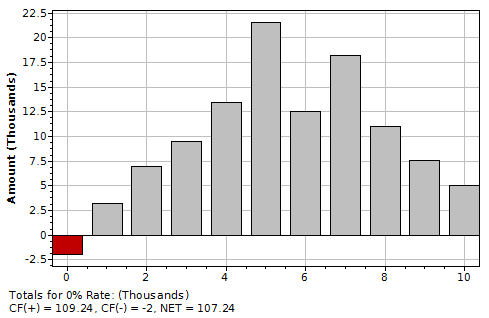 money paid out), whereas further positive cash values indicate money earned (or received) from the investment. This convention applies for all other calculations. Financial calculations may be performed in any input modes. Reverse Polish Notation (RPN), however, is supported by the many financial calculators, and therefore, example calculations will be given using RPN in the financial sections of the User Guide unless otherwise stated. See Calculator Input Style for information about input modes. Info. The Bond Calculations section gives the same example using both RPN and algebraic input. DreamCalc Profession Edition provides an additional set of financial keys. Financial calculations are not available in other editions of DreamCalc — if you haven't installed the Professional Edition (DCP), you can download it from www.dreamcalc.com. Date values are used with several financial functions, including bond calculations. You may find the that DreamCalc handles dates differently than other calculators. For more information, refer to Calendar Calculations. Examples in the financial sections of the User Guide will be given using two digit precision, unless stated otherwise. 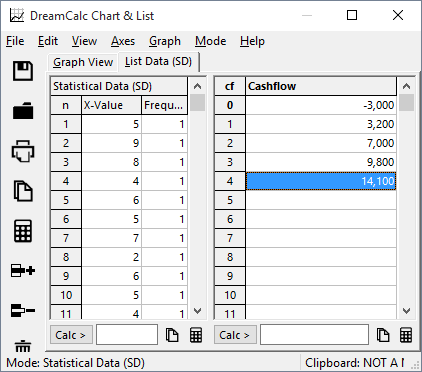 If you work with cashflow data, you will find that the DreamCalc Graphing & List Window allows you to quickly enter cashflows and integrates with your spreadsheet application. It will also give you instant cashflow and cumulative cashflow charts. To show the Graphing & List Window, press F12 at any time. Now, to display the Cashflow Chart, as shown below, click: Graph→Cashflow. A cumulative variation may be shown by selecting: Axes→Cumulative. The most convenient method of data input to use the cashflow list in the Graphing & List Window. This can be found on the "List Data" tab, to the right-hand side of the window. The main calculator interface is instantly aware of any modifications you make here, and your input can be used in Discounted Cashflow Calculations. Alternatively, you may enter cashflows using the main keypad. The [CF0] button clears the data in the cashflow list and enters the current value as the first amount. Use [CFj] to add consecutive values, and [Nj] to add multiple entries of the same value. The cashflow list will now contain the amounts: -1000, 800, 500, 500, 500. Additions to the cashflow list made this way will also be visible in the Graphing & List Window.